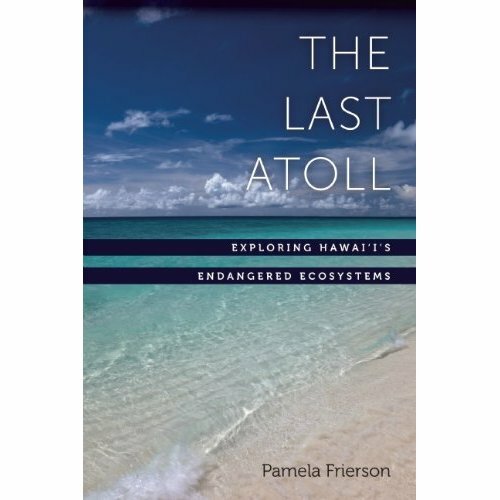 The Last Atoll: Exploring Hawai’i’s Endangered Ecosystems is Pamela Frierson’s first-person account of her journey up the Hawaiian Archipelago to the Northwestern Hawaiian Islands. The most commonly known islands of the archipelago, from east to northwest, are Hawaiʻi, Maui, Kahoʻolawe, Lānaʻi, Molokaʻi, Oʻahu, Kauaʻi, and Niʻihau. The distance from the eastern shore of Hawaiʻi island to the western shore of Niʻihau is roughly 380 miles. The entire archipelago, however, stretches for about another 900 miles to the northwest. On the tiny islands beyond Niʻihau, ecosystems are allowed to exist more or less untouched by the urbanization that is occurring on the principal islands of Hawaiʻi, especially on Oʻahu. Although these ecosystems remain mostly undisturbed, they are beginning to feel the effects of the world beyond their shores. Pamela Frierson is the author of The Burning Island, and numerous articles and essays about the Pacific world. Her work has appeared in several anthologies, including The World Between Waves, A Thousand Leagues of Blue, and Intimate Nature. She is one of forty-four writers invited by Barry Lopez to write original work for Home Ground: Language for an American Landscape, featured on NPR’s “Living on Earth” program. In 2012, she received the Hawai`i Elliot Cades Award. This entry was posted in Globalization, Hawai'i, Uncategorized and tagged Atoll, conservation, ecology, Environment, Hawaiʻi, Hawaii, nature, Northwest Hawaiian Islands, pacific islands, pollution, polynesia, wildlife. Bookmark the permalink.